Desperately Seeking Adventure: Delhi, India: Taxi, Taxi! After arriving in Delhi I was ready for the first phase of my jam-packed Indian holiday, it wasn't much of a holiday because I had such a busy itinerary. Taking a taxi tour was something my parents did during their visit to the city, they recommended that I see some of DEL's finest sights by taxi. I booked up with my hotel before my arrival, ensuring things were sorted. Go, go! 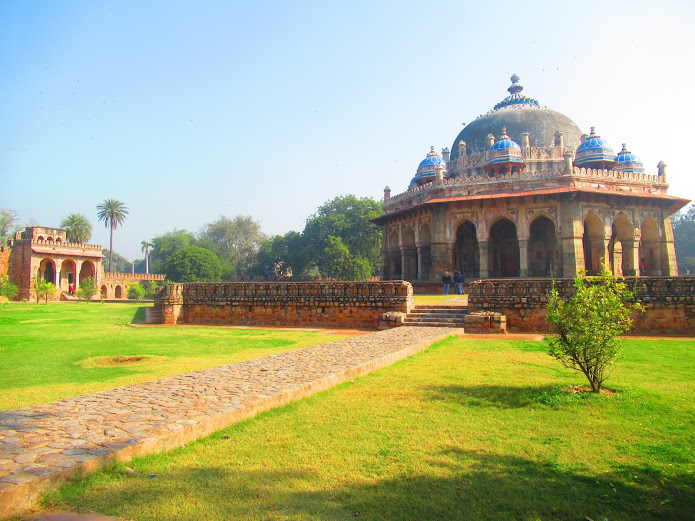 I had literally arrived into Delhi the previous night to an utterly chaotic scene at the airport, after catching a few hours sleep and some breakfast it was time for my Delhi Taxi Tour. My hotel didn't feel like an oasis of calm until I ventured out in my taxi that morning, but it did not take long to be blinded by the maddening sights and sounds that took over instantly. China had nothing on India, it's Delhi capital city vibe made 北京 appear rather sleepy! Rickshaws weaved through the bustling traffic, safety didn't seem to be the theme on the streets, it was pure bedlam! I had no clue what the first stop of day was going to be, it was something already amazing to see the craziness of Delhi's bustling streets, people and vehicles of all kinds were making their way past at break-neck speed and without any caution applied! In that moment the taxi seemed like the safest place, sure my eyes were forced wide open by Delhi's madness! Delhi's Jama Masjid turned out to be the first stop, stepping out of the taxi I had my belongings close to me, I couldn't judge what reception would greet me but it was all good. Entering the main courtyard gave me a wide screen view of the largest mosque in India, crafted by the Mughal Emperor Shah Jahan between 1644 and 1656. Access inside the mosque wasn't permitted for non-Muslims, I respected that because the architecture from the mosques exterior was enough to marvel at. I hadn't banked on seeing India's largest mosque during my first berserk morning in Delhi. Chandni Chowk, the area that Jama Masjid fell into looked intriguing to me, at that early point I knew that I would be revisiting that corner of Old Delhi before my Air India flight for Birmingham on the 21st of December 2018! Learning fast that Delhi's history was rich, the Mughal rulers hailed from modern day Uzbekistan, something that I wasn't expecting to hear! How Chandni Chowk was so mad for a Sunday! Raj Ghat was a no go, that Sunday chillness had finally surfaced as the remnants of the former British settlement of 'New' Delhi! No stresses that morning, it was all good! Things were kept all Mughal. Arriving at Humayun's Tomb was totally new for me, I was still learning about India's former rulers, I was being schooled for sure. The gardens surrounding Humayun's Tomb impressed me much, it was like a lush Indian summers garden. I made tracks around the visibly accessible parts but if truth be told I didn't really know where I was meant to be going, somewhere advertised peacock gardens but I didn't see those beautiful terrifying Asian birds. I was drawn back to the tomb of Isa Khan Niazi, a Pashtun noble in the courts of Sher Shah Suri. The garden in the round that had a simple yet very elaborate tomb planted in the centre gave me one amazing view, the vivid colours reflecting in the sun gave me everything. I was so glad that I had brought enough money with me on the taxi tour, the thought of having to pay multiple entrance fees didn't make me feel good, as it stood the Jama Masjid was free to access and Humayun's Tomb only set me back a few hundred Rupees, all was well. The morning so far had been insightful, I had seen two Mughal inspired sights within what was known as 'Old' Delhi. As my taxi grew closer to the third stop I noticed the streets close in a little, things seemed more orderly and all the houses looked very ordinary and neat. Nearing the former compound that housed the British dignitaries during Indian's British Colonial rule sparked one of the main reasons why I had chosen to visit Delhi in the first place! Passing the Victorian styled Lodhi Gardens gave me a sense the days of the British Raj will always have a place in Delhi past, present and future. Delhi had shown me so much in such a short space of time, I was ready to see something about the great, Mahatma Gandhi. 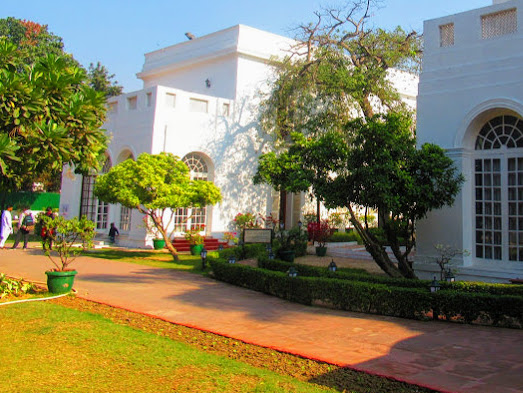 Having the opportunity to have visited Gandhi's House was a moment in my life that I will not ever forget, it was a serene places with a sobering wave of calm that acted as a warm blanket from the worlds troubles. Gandhi's House stood still, painted with a holy white shade gave things a sense of pureness, Gandhi stood as a figure of peace during his time and that vibe transcended within the perimeters of his former home. Captured to the left standing near to Gandhi's bedroom I found 'Gandhi's Steps', from the door he left on the morning his life was taken away from him I saw footprints in the footpath to symbolise his final movements. Rightly so, photography and etiquette was being monitored around the whole expanse of the gardens that surrounded the house, I stood further back enough to take that photo with caution and respect present in my mind. Yes, I felt at peace during my visit to Gandhi's House in New Delhi. The simple yet thought-provoking exhibits that detailed Gandhi's final days really hit home that India had then lost its most influential person of the time, as Mahatma worked alongside the British to peacefully push independence for India from the British. I noticed that Gandhi didn't stand as a negative feature, he simply wanted what the Indian people wanted after the British Raj had lasted for over 89 years till India gained independence in 1947. A colourful series of puppet scenes showed the life events of Mahatma Gandhi's youth and through his other monumental life events that shaped his life, snippets of the British Raj cropped up and it was clear during Gandhi's time in South Africa had shown him that the British worked a certain way in their other Colonial outposts. Upon my exiting of Gandhi's House I felt calm and collected, the whole experience was so chilled and levelling I felt good. With Raj Ghat being closed that morning, the afternoon's offerings made up for that, DEL! Lunch really needed to happen! Stopping first at what looked like an English precinct with restaurants didn't impress me, I hadn't gone all the way to India to be fronted with expensive food that wasn't worth the price or that didn't have any character! Making those feelings clear, the driver found a place called the 'Copper Chimney'. Ordering the Masala chicken with garlic naan bread and an ice cold lassi to drink was a winner! Onto the next place, that was meant to be the Lotus Temple but being without a phone that had any signal and the relaxed attitude of the driver with such a crowd growing didn't make me feel comfortable, I called that attraction off without hestiation! Heading for India Gate beckoned the final port of call for my Taxi Tour, throughout the morning I had seen some amazing places and the lunch was worth questioning, I wasn't dealing with that tomfoolery at the Lotus Temple for nobody DEL! Leading up to India Gate, the Rajpath was rammed with people enjoying their Sunday afternoon. Lined with empty tiered seating I questioned why they sat where they did, finding out the Rajpath is used for processions and parades that include Indian Independence Day made perfect sense. 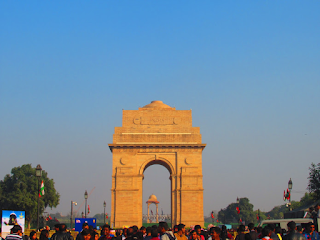 The long wide design of the Rajpath oozed Britishness, the focal point being the 'All India War Memorial' grand with its rich stone shade I was thankful it towered above the building crowd that snaked all the way down the Rajpath. Finding an ice cream, I took in the sights during those moments, people hustled and then some with their goods for sale. Content with my snaps I went back to the taxi, concluding the tour we drove past the Indian Ministry of Defence. The immediate area confirmed why that area was defined as 'New' Delhi with its British Colonial style. After a long trip I felt fulfilled with that I had witnessed during my first full day in India, returning to my hotel it was nice to have a rest.